DARK TREK Meet the crew of the USS Callister in the fourth season of Netflix's Black Mirror. Ranking episodes of Black Mirror is like trying to decide which Beatles song is your favorite—there are just too many good ones. Every season has a few big standouts of course and the fourth, released last month, is no exception. If you haven't already jumped on the bandwagon, Black Mirror is a science fiction anthology series in the vein of The Twilight Zone and The Outer Limits. Every episode is a self-contained story (beginning, middle, and end) with different characters and settings and most are an hour long or more. This makes the series feel less like a show and more like a very well-curated collection of feature-length films. Since it doesn't matter which order you watch them in, you can skip around. 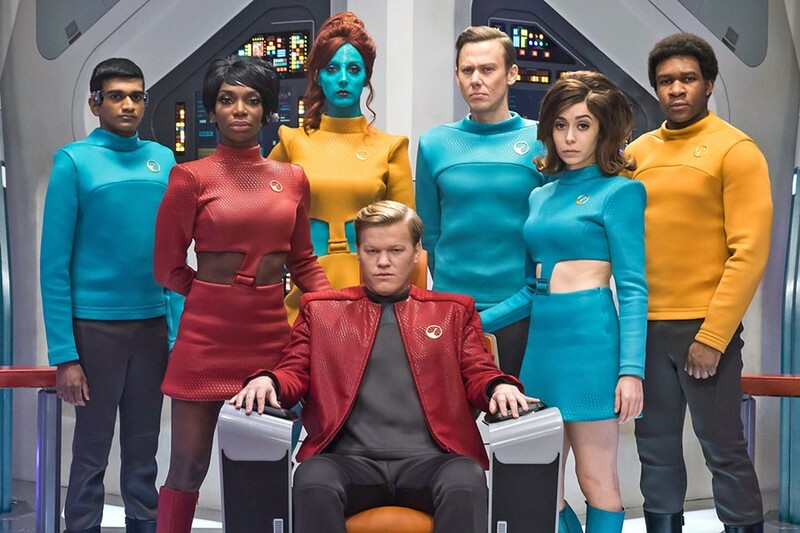 And after watching season four, I actually recommend that newcomers start out with two of its episodes "USS Callister" and "Hang the DJ." Both are perfect feelers for the series as a whole and among the best episodes to date. "USS Callister" follows Robert Daly (Jesse Plemons, Breaking Bad, Fargo), the programmer behind a popular multiplayer online game called Infinity. Daly is shy, passive, and socially awkward in the real world. But in the world of Infinity, Daly is fearless and outgoing as the captain of the USS Callister starship. The members of Daly's crew appear to resemble his real world co-workers in Wizard of Oz-like fashion. We see instances early on of Daly using the game to take out work-related frustration. For example, Daly resents his business partner James Walton (Jimmi Simpson, It's Always Sunny in Philadelphia, Westworld) for taking more credit than he deserves in regard to the creation of Infinity (which he co-founded with Daly in name only). Daly is too timid to ever confront Walton in the real world of course. But on the USS Callister, Walton is merely a subordinate officer who Daly constantly abuses verbally and physically (choking him almost to death in one scene). But it's just a video game right? No one's really getting hurt? I'll let you find out for yourself. "Hang the DJ" follows two protagonists, Amy (Georgina Campbell, King Arthur: Legend of the Sword) and Frank (Joe Cole, Skins, Peaky Blinders), who meet on a blind date arranged by a dating app similar to Tinder. The only difference is this app is mandatory and enforced by the government. No big deal, right? And trying to date outside of the app's jurisdiction is a criminal offense punishable by imprisonment or death.